The Congress led UPA Government on Thursday announced the extension of Rashtriya Swasthya Bima Yojana (RSBY), a health insurancescheme for below poverty line (BPL) families to auto and taxi drivers. The government has decided to pay 50 percent of premium amount under the scheme. The rest 50% of premium along with Rs 30 as registration fee will be borne by the policyholders. The Central and the State Government will share the premium 25% each. Commenting on the scheme, the Minister for Road Transport and Highways, Mr. Oscar Fernandes said, “The Rashtriya Swasthya Bima Yojna will address the health concerns of auto rickshaw drivers and taxi drivers, who form an important and vulnerable segment of the un-organised workers in urban areas." RSBY is a social security scheme run under the Ministry of Labour and Employment. Under the scheme, BPL families of maximum five members holding yellow ration card get cashless hospitalisation benefits of up to Rs 30,000 per family per annum in public and private hospitals as well. 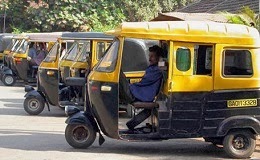 The central government has asked state governments to identify such auto rickshaw and taxi drivers and prepare data for the purpose of implementation of the scheme. Owner-driven rickshaw and auto drivers are also proposed to be covered under this scheme. As per the official statement, the nodal officer from the Ministry of Road Transport and Highways for the scheme has been nominated. Nodal officers from States of Uttar Pradesh, Karnataka, West Bengal, Kerala, Jharkhand, Chhattisgarh and Haryana with their name and contact details are also being notified for the purpose of implementation of the scheme, said the statement.